This afternoon we were invited to a birthday party at The Little Gym. What a fantastic time! 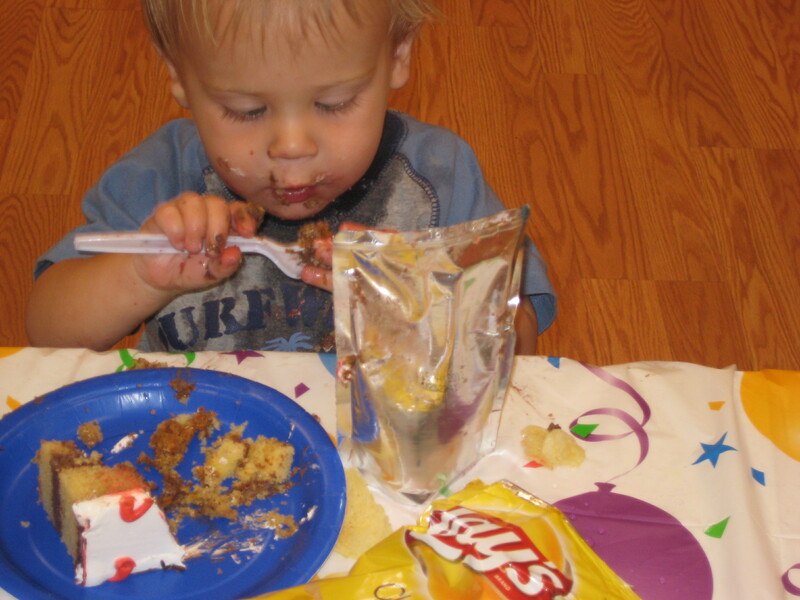 (yes, that is my 15 month old gorging on cake, chips and juice) Sure, the kids had fun, but for me, it was like a hugging jackpot. I need to pick up the knitting counter so that I can keep track of my number of hugs throughout the day, but I keep forgetting! I need that soon! My memory can’t keep up with these numbers….and I LOVE it! In between the non birding class and the party, I stopped at Office Depot for some ink. (random, I know) The employee that assisted me was a young man. He seemed bored and just went through the motions of ringing up my purchase. When he was done, I asked him for a hug. Oh, what a sweet boy. He got the biggest smile on his face as he leaned in for his hug. It was one of those smiles that says, “you just made my day and this will keep me going through the rest of my shift!” I hope it stays with him longer than that.